The room was very small. It was like a made-over Motel 6. The hotel needs some renovation. It’s obvious that the owners have bought very modern furniture (which is very beautiful) as an attempt to try and compensate for the damaged structure. The staff is so nice! Customer service is A-1. It appeared very clean and smelled fresh! I love that there’s a small strip mall within walking distance. Lastly the shuttle van is awesome! I will definitely stay there again! We stayed at this hotel during Mardi Gras week. First off, once arriving in the room, there were no towels, wash cloths, hand towels, or bath mats in the room. Went to the front desk to request some because the Phone in the room did not work to call the front desk. Later that night tried to warm up the food in the microwave and it did not work nor was it replaced throughout the entire stay. ALSO the few towels and wash cloths that we were able to finally get from the front desk— were taken by the house keepers once they removed the linen and trash the following day, they were not supposed to take the towels and wash cloths that were hanging up due to it being a green hotel, where if you wanted the linen replaced leave it on the floor or hang it up to keep. Not sure why she even came in the room because she did no housekeeping besides taking those items despite. Asked the housekeeper the following morning for towel and wash cloths, and she tells us she cannot speak English which was BS because she was speaking English just fine to another person. So out of the entire stay it was a complete inconvenience with this hotel having no linen in our room the entire stay unless we went and begged for it, microwave did not work, phone did not work, and the balcony door handle was broken. The halls smell like mold and mildew. Our entire group was very dissatisfied with the entire stay. And will never stay here again nor recommend this hotel to anyone. Front desk staff very friendly. Hotel lobby had contemporary, inviting decor. Nicely appointed rooms and comfortable bed. Only downside was we couldn’t use the pool or hot tub, since it was outdoor and closed for the season. The hot tub wasnt clean, had sand all in it, the toilet handle was broke, and the sink drain was broke. Hated that there was only 1 way into the property when the room was all the way in the back. Staff was very nice, and friendly. The TV did not work for our entire stay. They said it was something with the service provider. I found this odd since the TV itself would not turn on. It was not explained why the Power to the TV would not come at all. I could have connected my laptop and been fine. Nice room, restaurant and facilities, but several maintenance issues with toilet, sink drain, tub drain and TV. Recommend not just check cleanliness but check functionality. Simple fixes! Close to the airport. The elevator and room floor smelled a little weird. Nice price nice location. Clean room but had an issue with key card at first, and bathroom light just flashed on and off instead of staying on. Located in Kenner - Louis Armstrong International Airport within a short walk of Lafreniere Park, Wyndham Garden New Orleans Airport is within 2 miles (3 km) of Clearview Mall. This 220-room, 3-star hotel welcomes guests with a restaurant, an outdoor pool, and a 24-hour health club. This hotel serves as home to a bar, along with a restaurant that specializes in Cajun/Creole cuisine. Order from room service to satisfy your hunger without leaving your room. Buffet breakfast is offered for a fee each morning from 6:30 AM to 10:30 AM. An LCD TV comes with cable channels, and guests can stay connected with free WiFi. Beds sport premium bedding and the bathroom offers a hair dryer and free toiletries. Other standard amenities include a balcony, a coffee maker, and free newspapers. 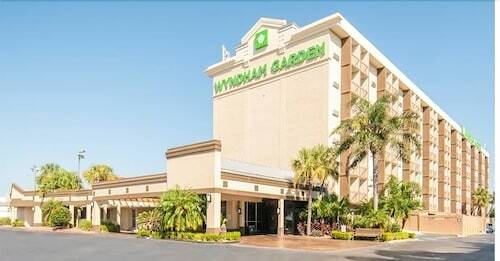 Guests staying at Wyndham Garden New Orleans Airport enjoy an outdoor pool, a 24-hour health club, and a spa tub. You can take advantage of free parking, along with a free airport shuttle (available 24 hours). Multilingual staff at the front desk are standing by 24/7 to help with securing valuables, luggage storage, and tours or tickets. Additional amenities include free WiFi in public areas, conference space, and a 24-hour business center. Thank You for your review it is very helpful; I am glad we were able to meet your expectations. Lafitte's - Restaurant and bar specializing in Cajun/Creole cuisine. Open daily for breakfast, lunch, and dinner. Jazz Lounge - Bar specializing in Cajun/Creole cuisine. Open daily for dinner. The preferred airport is New Orleans, LA (MSY-Louis Armstrong New Orleans Intl. ): 13-min drive, 4.4 mi/7 km. The front desk is open 24 hours a day, and checking out is easy with express services. For convenient arrivals and departures, you can take advantage of the free airport shuttle (available 24 hours). Driving? This property offers free self parking, along with free extended parking.